We gave a brief presentation on Why We Do What We Do at the In Conversation Forum organised by the Raffles Girls School. The forum discussion is on environmental actions and we thought it would be good to share with the students 4 typical mindsets behind Singapore’s environmental actions. Our mindsets shape our actions and it is important to adopt the right mindset. A grid was used to show the 4 different mindsets. The horizontal axis ranges from local actions to global or regional actions. The vertical axis ranges from passive actions to active actions. Local passive actions are shaped by our Wait and See mindset. We’re not really sure so let’s wait for others to take the lead. There’s too many changing factors so let’s wait and see. Solar energy is too costly so let’s wait for the cost to come down before we see how to adopt solar energy. Let’s wait for the developed countries to take the lead on climate change and then we see how to respond. When we adopt a Wait and See mindset, our actions tend to be passive. Local active actions are shaped by our Clean and Green mindset. 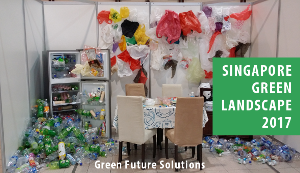 We want to be a clean and green city. We want to be a garden in a city or city in a garden. We want to prevent pollution, increase our natural spaces and achieve water independence. We want a clean and green Singapore so that we will have a good quality living environment and we can attract tourists and businesses. When we adopt a Clean and Green mindset, our actions tend to be active. 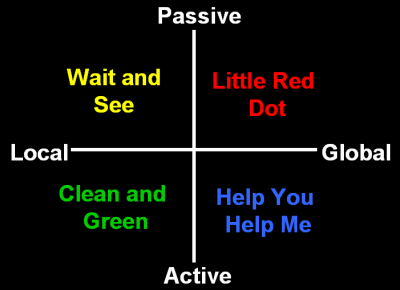 Global passive actions are shaped by our Little Red Dot mindset. We’re just a little red dot, what can we do? We’re just a small island state with no natural resources, no hinterland and we import most of our food and fuel. We’re just a little red dot, who are we to tell our bigger neighbours to take care of their environment. We produce only 0.2% of global carbon emissions, we’re just a little red dot. When we adopt a Little Red Dot mindset, our actions tend to be passive. Global active actions are shaped by our Help You Help Me mindset. By helping other countries, we are actually helping ourselves. When we help China to build an eco city in China, we are helping ourselves because we benefit when China goes green. We get to export our expertise and help our local companies do business in China. When we help Indonesia to combat forest fires in the Jambi province, we are helping ourselves because we will have less haze problems. When we help others, we are helping ourselves and enjoying the benefits. When we adopt a Help You Help Me mindset, our actions tend to be active. The four mindsets are not exclusive and our actions tend to involve one or more of the mindsets. What we want to see is more focus on the lower half instead of the upper half. More of the Clean and Green and Help You Help Me mindsets, and less of the Wait and See and Little Red Dot mindsets.